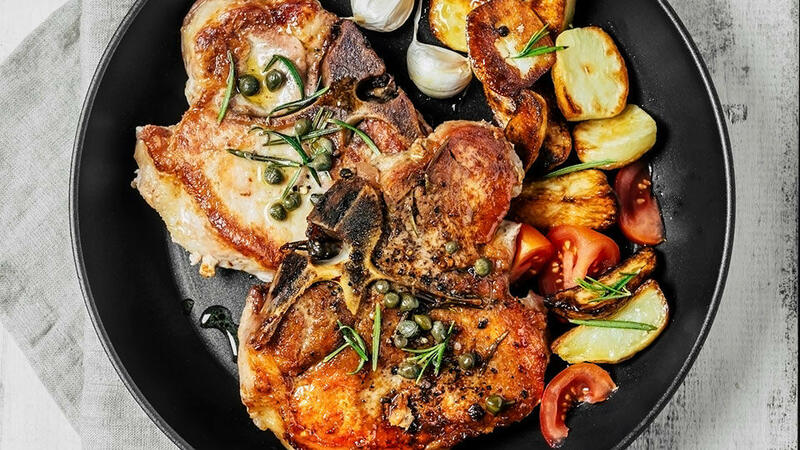 Pork chops are sometimes called “the other white meat,” and too often, they’re cooked into oblivion until they do, indeed, resemble dry chicken. But pork chops have amazing potential. Cooked properly, pork chops are flavorful, juicy and meaty — nothing like an overcooked piece of chicken breast. We asked some contestants from Bravo’s Top Chef Season 14 for their tips for cooking perfect pork chops every time. Follow their lead, and you’ll be cooking like a pro in no time. Those thin boneless pork chop filets sold at the grocery store? They’re basically setting you up for disappointment. Chef Casey Thompson recommends opting for a double-cut bone-in chop, while Chef Brooke Williamson suggests looking outside the grocery store. “Heritage breeds are the first way to go, as they tend to have more fat, marbling and flavor. That’s my biggest tip of the day. There are farms all over the country who raise some incredible pigs and are happy to butcher and ship,” Williamson says. She reminds us that if you start with quality product, you’ll be more likely to wind up with quality results. The key to seasoning pork chops throughout is to start well before you actually start cooking. Chef Sylva Senat recommend marinating your pork chop for at least four hours or overnight, while Williamson and Thompson recommend a brine. Thompson brines her pork chops in dill pickle juice for four hours, which is a simple way to boost the pork’s flavor. Williamson prefers a 24-hour brine, and usually seasons the brining liquid with salt, sugar, bay leaves, coriander and clove. Either way, a marinade or brine is essential to imbuing your chops with flavor. 3. Don’t over cook it! Most of us are used to eating tough, gray pork chops. But these days, even the FDA says that it’s safe to eat your pork once it’s been cooked to 145 degrees F thanks to advances in the farming and processing of pork (though at least one of our chefs prefers their pork a little rarer, around 140 degrees F). “Nothing can help you if you’ve overcooked your meat. I tend to err on the side of under rather than over, even when it comes to pork — and especially when it comes to loin or chops,” Williamson told SheKnows. Her preferred method for perfectly cooked chops? “I like the high-heat-then-rest method because I find it’s the best way to lock in the juices,” she said, recommending that home cooks sear the chops over high heat on the stove first, then transfer the pan to finish cooking in the oven. Thompson and Smith also like grilling their pork chops — it adds additional smoky flavor to the meat. When all else fails and you fear you’ve overcooked your chops? “Slap a square of salted butter on top and call it a day,” suggests Williamson. Your pork chops are finally done, but the hardest part is yet to come — letting the meat rest. Resting your meat for 10 minutes before you start cutting into it allows the juices within to redistribute, so the meat is succulent throughout. So, think you’re ready to try making Top Chef-quality pork chops at home? Check out Jim Smith’s grilled pork chop recipe (but keep some salted butter handy just in case!). Set up the grill and preheat it to medium-high heat. In a medium mixing bowl, whisk the sherry vinegar, shallot, mustard, lemon juice, honey and salt and pepper until combined. Gently add the oil into the vinegar mixture by pouring a steady stream of the oil into the vinegar while whisking. Add the herbs and season to taste. Set aside. Generously season the pork chops with salt and pepper and grill them to an internal temperature of 145 degrees F, about 3 minutes per side. While cooking the pork chops, toss the halved cucumber and onion rings in the vegetable oil and season with salt and black pepper and grill. Let the onions and cucumber get a good char before removing them from the heat and allowing them to cool. When the cucumber and onions are cool, cut the grilled cucumber into half-inch pieces and place them into a mixing bowl with the grilled onion and the rest of the salad ingredients, season with salt and black pepper and dress with the vinaigrette. For plating, place the pork chop on the base of the plate, top with the salad and finish with a squeeze of lemon juice.